Discussion in 'The Lounge' started by BurlyShirley, Jul 6, 2010. 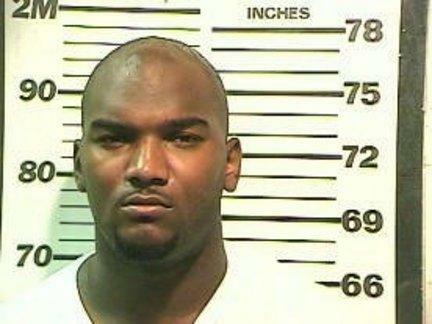 MOBILE, Ala. -- Former Oakland Raiders quarterback JaMarcus Russell has been charged with possession of a controlled substance -- codeine syrup -- after being arrested at his home in Alabama on Monday, authorities said. JaMarcus Russell, who was released on $2,500 bond, is due back in court on July 20.The 24-year-old former LSU star and the No. 1 draft choice in 2007 was arrested as part of an undercover narcotics investigation, said Mobile County Sheriff's spokeswoman Lori Myles. She would not say what led to his arrest. She said he did not have a prescription for the codeine. Myles told reporters that several people were in Russell's home at the time of his arrest but Russell was the only person taken into custody. Russell has a bond hearing scheduled for Wednesday and is due back in court on July 20. "We understand that typically sometime this codeine syrup is mixed with a beverage, like sprite, and they call it sip-sip," Myles told WALA-TV in Mobile. The Raiders released Russell, considered one of the NFL's biggest draft busts, in May after he won only seven of his 25 starts and was benched. He completed just 52.1 percent of his passes in his career with 18 touchdowns, 23 interceptions, 15 lost fumbles and a passer rating of 65.2. Nice ESPN Vid about Purple Drank at the link. What a great way to get the attention of future would-be NFL suitors, Jemarcus! 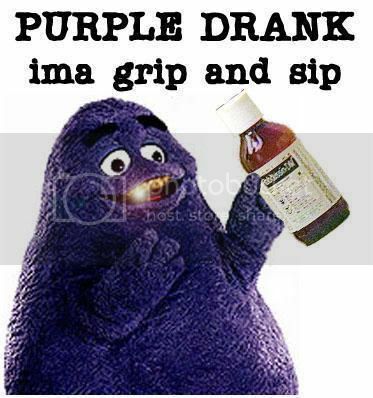 I like how the Purple Drink makes you stoned and fat. Perfect explanation for JaMarcus. I love it! That should just about finish him up from ever playing (or trying to play) in the NFL again.